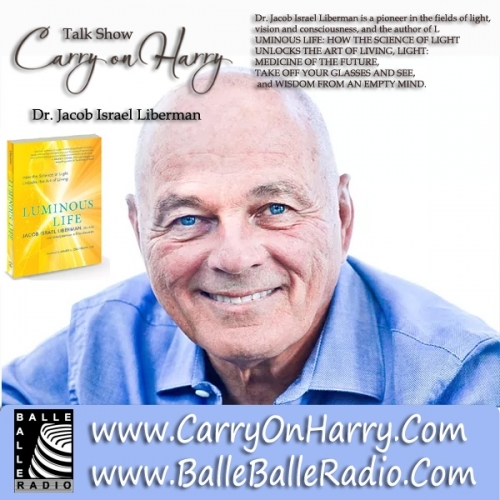 Studio CarryOnHarry Talk Show guest Dr. Liberman joined us from Hawaii to discuss his new book uminous Life: How the Science of Life Unlocks the Art of Living.On the talk show episode he shared many things that proves how Light is the real source of healthy living. According to his teachings your eyes are the windows to your soul - the key to "seeing the light" that expands your consciousness, allowing you to experience greater presence and aliveness than ever before. That's the premise in Dr. Liberman's newest book, Luminous Life: How the Science of Life Unlocks the Art of Living. Integrating 40 years of research, practice and direct experience, this groundbreaking book presents a new science of life. Dr. Liberman's journey began early in his optometric career, when he experienced a sudden, significant, and permanent improvement in his vision during a meditative experience. This seemingly inexplicable event led him to question standard medical beliefs and practices, investigate the therapeutic value of light and color, and wonder if our fundamental ideas about life are flawed. His initial research revealed that most of us are not looking where we think we're looking. Our "mind's eye" is not focused on the same location as our physical eyes. But when this misalignment is corrected through simple practices, vision improves and presence expands, impacting nearly every aspect of our lives. Dr. Liberman also found that what's "catching our eye" is actually looking for us. So he conducted an experiment, allowing everything that "caught his eye" to guide his action. After attempting to respond to life, rather than trying to direct it, he experienced an extraordinary level of ease, joy and connection with everything that entered his awareness. Things flowed without effort or struggle. By allowing the light that attracted him to effortlessly focus his eyes and attention, he experienced true "presence" - and discovered that light is always guiding us and illuminating our path. According to Dr. Liberman, "Presence is an involuntary response to an invitation by life's intelligence pointing us toward our maximum potential." Despite popular belief, presence is not about thinking ahead or trying to be here now. It's a naturally occurring state that arises when our eyes and mind, activated by light, focus on the same place at the same time. In response to light's guidance, our eyes begin an intricate dance of aiming, focusing, tracking, and teaming, bringing us to extraordinary states of awareness without effort.